Inventory We are a resale marketplace, not a box office or venue. Ticket prices may exceed face value. This site is not owned by Landers Center . The Landers Center is home to the Mississippi RiverKings of the Southern Professional Hockey League. The venue opened in 2000 as the DeSoto Civic Center, changing its name in 2011. The seating capacity is 8,400 and the arena was built for $35 million. 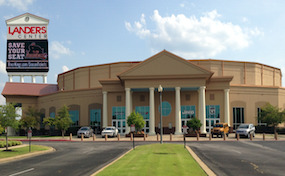 The Landers Center box office is located at 4560 Venture Drive in downtown Southaven, Mississippi. Landers Center tickets have included many family shows like Disney On Ice, Monster Jam, and the Ringling Brothers Circus. Landers.CenterSouthaven.com is not currently affiliated with any official website, primary vendor, venue, and or supplier. We are a privately owned and operated company that concentrates solely in the online retail of all events in the secondary ticket market. Prices on our sites tend to be above face value and will change quickly with public demand. To order tickets to all Landers Center Southaven events simply follow the process online through the checkout.